Cornish rex cats are athletic, energetic and highly affectionate pets. If spending time around cats brings on sneezing, itchy eyes and aggravated sinuses then you are one of millions of people who are allergic to cats. Despite this, you might want one as a pet, so for your own comfort choose a breed that is least likely to trigger allergies. Cat saliva contains a protein (Fel D1) that is the primary cause of cat allergies. Cats frequently groom themselves with the tongue, and the protein spreads across the fur. It is a very small particle, and as the spit dries it will release from the coat and become airborne. Some people exposed to the protein then suffer allergy symptoms. Some breeds of cats are known to produce less of the Fel D1 protein, and these are known as hypoallergenic or low-allergen breeds. 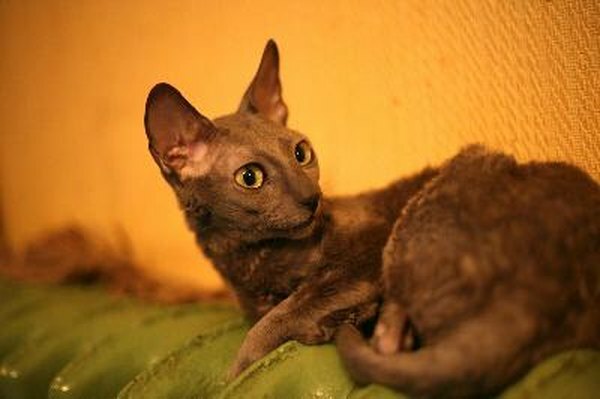 Both the Cornish and Devon rex are regarded as hypoallergenic cats; and both have unusual coats for cats, with very little shedding. The Cornish rex has a downy coat of fine hair that is similar to a poodle coat and is wavy in appearance. The breed is well-suited to indoor living. The Devon rex is similar in appearance but has very large ears, set wide apart. Their short, curly coats give them a rippled appearance. Three Oriental cat breeds are known to produce fewer allergic reactions in people. The Balinese looks like a long-haired Siamese but is known to produce less of the Fel D1 protein than other cats. The Javanese has a medium length coat with no undercoat which seems to cause minimum problems for allergy sufferers. The Oriental shorthair is also tolerable to most allergy sufferers but should be brushed and wiped down frequently to prevent problems. A Californian company has produced a designer hypoallergenic cat specially bred with a modified version of the Fel D1 protein that is less irritating to humans. This is an ideal consideration for nesters who can afford them -- they cost several thousand dollars each. If an engineered cat is too expensive, look for a low-allergen breed of cat and spend time with it before adopting so you'll know you're choosing one that doesn't trigger allergic reaction. Installing a HEPA air filter in your home is a worthwhile hedge. Cat World: Hypoallergenic Cats - Do They Exist?